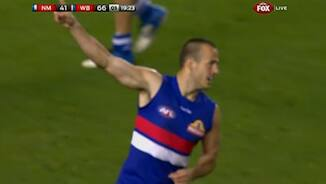 Should this Kangaroos goal have been a Bulldogs free kick? Boyd has played an outstanding match, he has notched up his 43rd disposal 20 of which have been contested. There's just over 2 minutes reamaining, the Dogs lead by 18 points. Smith is awarded the free for holding the ball, it was a brilliant tackle, he lines up 50 out right in front but the kick just falls short & North clear. Edwards takes the grab 45 out, he lines up right on 50 but his kick falls short, no one can take the grab & the Dogs clear through Murphy. North work their way inside 50 but once again Lake is strong in defence & takes the contested grab. BEHIND DOGSSherman snaps from around his body, it's coming back... but not enough! BEHIND DOGSAnthony's handball out of defence is intercepted by Giansiracusa, he sends a high ball inside 50 & Cordy takes the grab just 20 out, he lines up directly in front but shanks it! North know that time is running out & they are playing on at all cost. GOAL NORTHPetrie takes the grab in front of Lake who goes to ground, Petrie plays on & waltzes into the open goal & it's back to a 16 point margin. Griffen has had 30 disposals, 12 which have been inside 50s. GOAL DOGSGriffen sends the ball inside 50 to the top of the goal square & Giansiracusa takes the contested grab on full stretch, he lines up 20 out & slots through his 3rd! BEHIND NORTHHarper lines up 50 out on a slight angle, he starts the kick left & it looks like it's coming back... but not enough, North trail by 16 points. North need 3 unanswered goals but it's hard to see them flowing, they currently look like they are running out of legs. BEHIND DOGSGrant takes a strong contested grab, he lines up 47 out just inside the boundary but he starts the kick left 7 he misses to the near side. North clear through MacMillan & work the ball forward. The ball is deep in the Dogs' forward line & it's a scrap match by both teams as the Dogs desperately try to get a goal & North attempt to clear. BEHIND NORTHPetrie measures the kick & sends the ball inside 50, it's an open forward line & Adams runs onto it but can't control it & Murphy rushes it through for a behind. BEHIND NORTHThomas receives a free for in the back, he lines up just outside 50 on a 45 degree angle, the kick falls short & comes off thepack for a minor score. 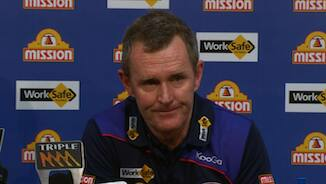 The final term is underway, the Dogs lead by 3 goals & the first goal will be crucial. Harvey has had just 13 disposals for the match & has had no impact on the match. BEHIND NORTHWells unloads with a long bomb from the boundary line, the kick is curling back just enough but it slams into the wood work! BEHIND NORTHEdwards is lunucky not to receive the free after being taken out of the contest, the ball spills free & Bastinac on full stretch soccers it off the ground but it goes left. 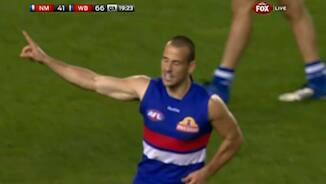 BEHIND DOGSGiansiracusa snaps from the forward pocket but his kick misses to the near side, the Dogs lead by 20. 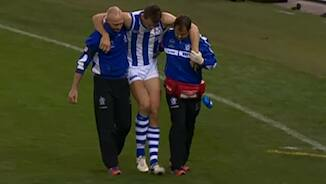 Minson is caught dropping the ball in the goal square & Goldstein receives the free, a lucky escape for the Roos. The Bulldogs continue to press but North are hanging on at the moment. The Dogs work the ball inside 50 & look dangerous once again with plenty of options, however Wells swoops on the ball & bombs it out of defence to Thomas in the middle. GOAL DOGSLiberatore with quick hands out to Wallis, he goes over the top to Murphy who runs to 35 out & drills it, the Dogs are back out to a 26 point lead. GOAL NORTHThomas sends the ball to the top of the goal square & Edwards takes the grab, he lines up 15 out directly in front & he gets it back to 20 points. GOAL DOGSIt's a high ball to the goal square & the ball spills free from the pack & Sherman runs onto it & goes BANG from the edge of the goal square. GOAL DOGSThe Dogs win the ball out of the middle, Sherman has the ball 48 out just inside the boundary, he unloads with a driving kick & he sneaks it home! GOAL NORTHA great tackle by Ziebell on Lake the ball spills free but Lake dives on the ball & is caught holding the ball, Petrie lines up 20 out on a slight angle & narrows the margin to 14 points! BEHIND DOGSHiggins has space & takes the grab, he lines up 45 out directly in front, the kick looks good off the boot but he sprays it to the left. GOAL NORTHThomas with the short kick finds Anthony who leads into space, he lines up 48 out hugging the boundary, it's a tough kick but he curls it back perfectly & splits the middle! North are trying to play their normal run & carry style of football but the Dogs are not allowing them to do so & North are turning the ball over at a rapid rate. GOAL DOGSHarper's kick across the face of goal is intercepted by Cross who plays on & with the low kick goals from 25 out on the slight angle! Dogs are back out to a 25 point lead. Thomas is sandwiched between two at half forward, Lake is in front & takes the grab. GOAL NORTHThomas sends the ball inside 50, there's no one home & he chases his own kick down takes possession opts for the banana on the run & nails it! GOAL DOGSIt's take 3 in the middle, Griffen sends the ball inside 50 & Dickson wins the ball, he has a snap on the turn 40 out & the Dogs lead by 25 points! The 3rd term is underway, it's stacks on on top of Minson & we'll have another bounce, this time the Dogs win the ball but don't get far... we'll have another bounce! HalfTime: The Dogs continue to impress with their attack & hardness on the ball, the Dogs lead by 19 points & it seems as though North are just holding on at the moment. The Dogs continue to belt North at the contested ball, the Bulldogs have won 86 contested possessions to North's 59. GOAL DOGSWallis receives the free after Ziebell slides into the contest, Wallis lines up 45 out directly in front & he sneaks it home & the Dogs lead by 19 points! Some controversy on the ground as the Dogs believe they should have been rewarded with the free for holding the ball or dropping the ball against Goldstein. GOAL NORTHGoldstein takes the grab in the goal square & plays on but is dragged down by Addison, the ball spills free & Thomas soccers it off the ground & through! The Dogs lead by 3 goals & Thomas' easy miss just minutes ago proves costly already. GOAL DOGSDickson receives the free after being held by Firrito, he lines up 20 out on a slight angle & he slots through his 3rd! BEHIND NORTHCunnington kicks to some space & Thomas runs onto it, he lines up 20 out on a slight angle & he sprays the kick across the face of goal. GOAL DOGSAgain North turn the ball over in the middle of the ground, it comes out to Giansiracusa who unloads with a high kick, it's travelling, it has the distance & the accuracy! GOAL NORTHThomas with quick hands over the top to Adams on the run, he unloads from 40 on a 45 degree angle & he gets an important goal for North against the flow of play. BEHIND DOGSAnthony fails to tackle Sherman as he plucks the ball out of the pack, he has a snap 38 out on a slight angle but he sprays the kick across the face of goal. 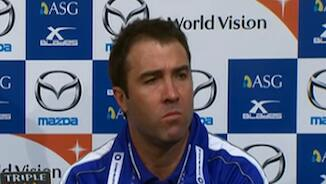 BEHIND NORTHEdwards has a snap for the Roos but he can only manage a minor score. GOAL DOGSDahlhaus with the long kick inside 50 & Cordy takes the grab in front of the pack, he lines up 15 out on the slightest of angles & gives the Dogs a 13 point buffer. The Dogs surge their way out of defence & inside 50 however Atley is in perfect position & takes possession of the bouncing ball, he is forced to twist & turn but North are out of trouble. GOAL DOGSThe Dogs run it through the middle, Higgins can't complete the grab 25 out, but he shows composure as he picks up the loose ball, edges out his opponent & runs into the open goal! North work the ball inside 50 once again, it's a high ball to the goal square but Lake beats Petrie & the Dogs clear. GOAL NORTHNorth waste no time as they get the quick reply, Anthony win it out of the iddle & bombs it inside 50, Harper picks up the crumbs, snaps & goals! GOAL DOGSGiansiracusa positions himself & takes the grab in between two opponents he lines up 40 out directly in front & splits the middle, Dogs lead by 7! BEHIND NORTHPetrie lines up 38 out on a slight angle, he unloads but the kick goes from left to right & he just misses! Boyd's disposal is letting him down today, he has had 16 disposals but his efficiency is at just 30 percent! Boyd wins the ball 40 out, he rushes his shot on goal & it's a terrible kick as it goes out on the full. Murphy is tagging Wells & is currently on top. Murphy has had 8 disposals whilst Wells has had just 2, North need to work Wells into the match. BEHIND NORTHNorth run it inside 50 from defence, Thomas has the ball 30 out & he soccers the ball goalward but his kick misses tot he left. BEHIND DOGSSherman has a snap from 35 out but his kick misses to the near side, another opportunity goes begging for the Dogs. The second term is underway & the Dogs are quick out of the middle. 1/4 time: The Dogs dominated most of the opening term but North started to work their way back into the match late in the term, the Dogs currently lead by 2 points. Anthony picks up the ball under pressure, he has a hurried snap but his kick goes out on the full. BEHIND NORTHThomas wins the loose ball, & with the short kick finds Adams who has found space & takes the grab, he lines up 40 out on a 45 degree angle but he sprays the kick from left to right. The Bulldogs are getting numbers behind the ball & it is making it difficult for North to work the ball forward, North have not been able to play on because they cannot break the man. 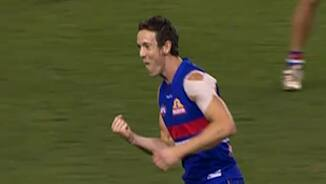 Dickson has started well for the Dogs, he has had 6 disposals, kick 2 goals & taken 3 marks. GOAL DOGSThe ball comes inside 50 once again for the Dogs, Dickson takes a great grab in the middle of the pack, he lines up 25 out on a slight angle & threads through his 2nd! North lead by 3 points & the score line will hurt the Dogs who have dominated the clearances, contested ball & the inside 50s. GOAL NORTHThomas leads off his opponent & takes the grab, he lines up 45 out on a slight angle & despite his reputation for missing set shots he drills this one beautifully! The Dogs are dominating the clearances & the contested possession at the moment. They have won 27 contested possessions to North's 18. Wells with the ball inside 50 but the easy mark slips through the hands of Edwards & straight in the hands of Minson as the Dogs rebound from defence. The Dogs continue to apply forward pressure & attack the ball, they have had 11 inside 50s to North's 4. North are struggling to run the ball out of defence. Griffen has started well for the Dogs, he has had 6 disposals thus far. GOAL DOGSNorth turn the ball over on the wing & the Dogs string handballs together through the middle, Griffen with the pass pinpoints Dickson who takes the grab 30 out, he lines up & nails it! Thomas with the inside 50 for North but his kick is intercepted & the Dogs clear from defence with ease. The Dogs are getting their hands on the ball first, they have had 31 disposals to North's 13 but the Dogs can not convert it to the scoreboard, North lead by 3 points. North have had 2 inside 50s for 2 goals, the Dogs have had 6 inside 50s for 1 goal 3 behinds. BEHIND DOGSBoyd with the shot 40 out on a slight angle but he sprays the kick for a minor score, North lead by 3 points. GOAL NORTHA great effort by Cunnington in the goal square as he is strong as he shrugs off his opponent who falls to the ground & Cunnington goes BANG! GOAL NORTHIt's a one on one battle between Petrie & Lake, Lake puts his hands in the back of Petrie & gives away the free, he lines up 48 out directly in front & drills it. The Dogs are off to a good start, North have had just 4 possessions thus far, the Dogs have had 3 inside 50s for 3 scoring shots. 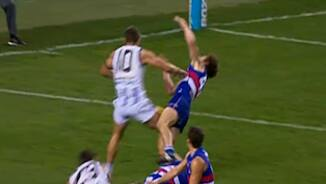 BEHIND DOGSThompson handballs into danger deep in defence, Higgins soccers it off the ground but he misses tot he left. GOAL DOGSNorth turn the ball over in the middle of the ground & the Dogs make them pay as Higgins lines up from the set shot 48 out directly in front & nails it. BEHIND DOGSThe Dogs win the free in the middle & bomb it inside 50, Boyd takes the grab 30 out on a tight angle, he unloads but he sprays the kick. The siren sounds, the umpire goes BANG & we're underway. Welcome to Etihad Stadium for the clash between North Melbourne & the Western Bulldogs. The Bulldogs have made a late change, Cooney has been replaced by Clay Smith.